In her new book, Knit Mitts, Kate digs deep into everything related to knitting mittens and gloves. From cast-on to bind-offs, and the proper sizing for everything in between, she’s left no stitch unworked. Following her instructions, you’re sure to have warmer mittens that fit better on people’s hands. When it comes to fit, there’s one make-or-break spot: the thumb gusset. 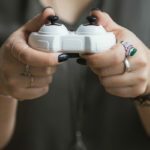 Humans have come to depend on their opposable thumbs. When we can’t move them easily, or at all, it’s like wearing tights that are too small. It’s the gusset that insures a better fit. What follows here are snippets from the pages of the “Making Mittens & Gloves” chapter. For even more detailed information and Kate’s basic mitten recipe, be sure to download a copy of the book today. This is an example of a mitten knit with a thumb gusset. To offer a wide range of sizing options, Kate surveyed over 500 friends and knitters. The results were interesting and from survey averages, you can better size the mittens you make from friends and family. Of course, it’s always better to knit to a person’s actual measurements. But since mitten fit is fairly forgiving, this hand-size information allows you to make a properly sized mitten based on some pretty basic information about the person it is intended for. Even just knowing age, gender, and relative size will get you what you need. And if you know one key measurement—hand circumference—you can be even more confident you’ll get a great mitten fit. Detailed hand measurements will lead to perfect fitting mittens. Just knowing someone’s hand circumference you’ll be on your way to better fitting. In Kate’s survey, adults reported hand circumferences between 6 and 11″ (15.25 to 28 cm). The average circumference for adults was 7 ⅔” (19.5 cm), and 90% of adults who contributed have hands measuring between 7 and 9″ (18 and 23 cm) in circumference. 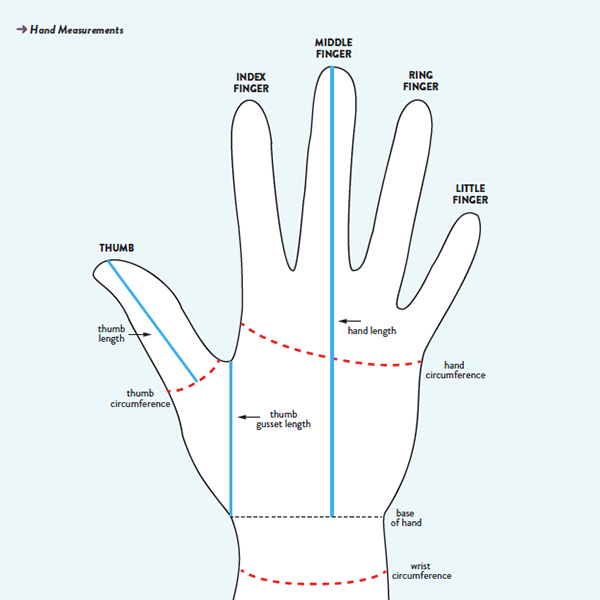 • Hand length from top of wrist to tip of longest finger is remarkably close to hand circumference. • For a woman, the length is typically a little smaller than the circumference; for men, the two measurements are typically the same. • Wrist circumference is a little bit more than 80% of hand circumference—83%, to be precise. • Thumb gusset length is 38% of hand length. • Actual thumb length is typically a third (33%) of hand length. “Gusset” is a tailoring term, and it specifically means a triangular piece of fabric that’s used to shape or size a piece of clothing. In this case, the gusset is the little triangle that fits around the heel of your hand below the thumb. 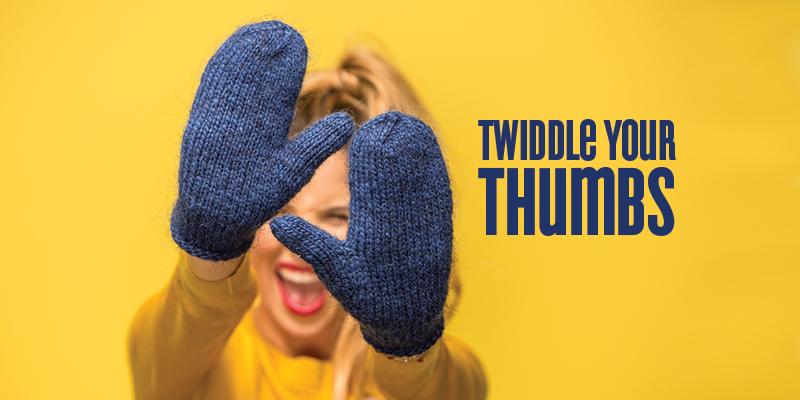 Mittens with a thumb gusset are more fitted, as they match the shape of your hand. 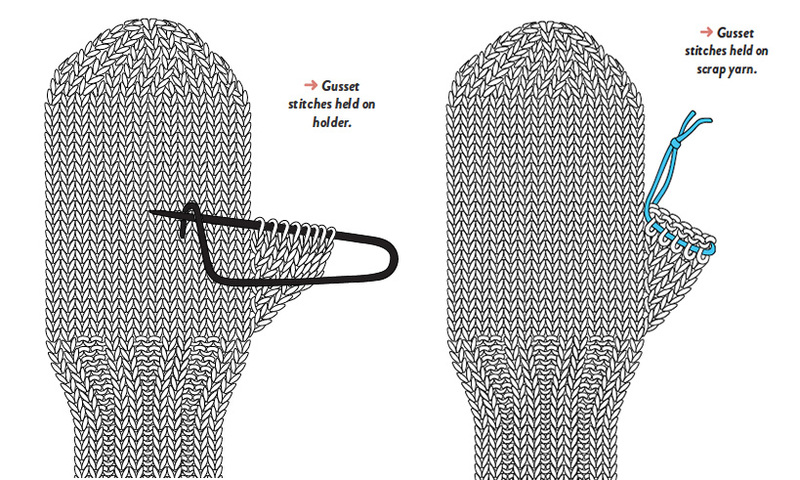 The thumb gusset is the triangle of stitches outlined in blue in this diagram. The gusset is shaped through paired increases. 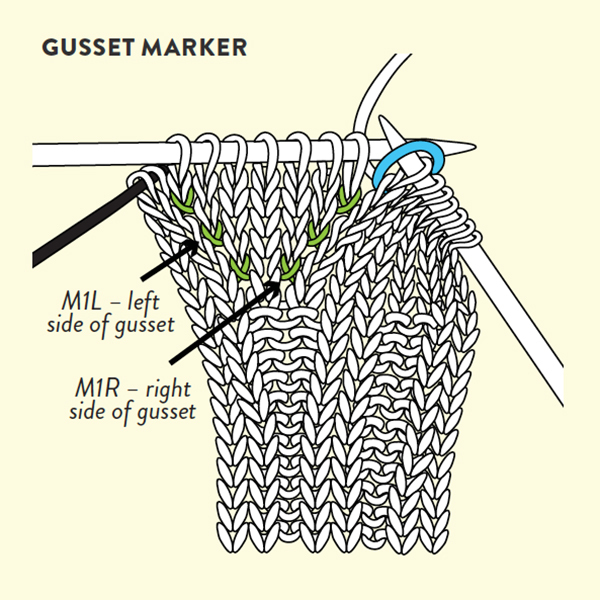 In the master pattern that appears in Knit Mitts, the gusset is worked at the end of the round. 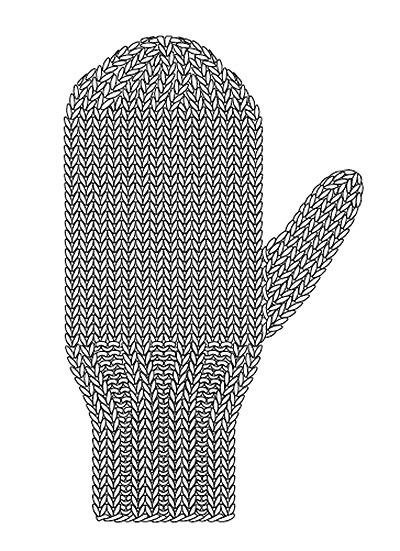 In some of the designs, the position is shifted based on how the pattern stitches align, and whether the left and right mitts are identical or fraternal. No matter where it is placed, the process is the same. In the setup round of a thumb gusset, you separate off a single stitch. If it is the last stitch of the round, you’ll place a marker before the stitch; the end of the last needle acts as a virtual marker after the stitch. If the base stitch is somewhere else in the round, place markers before and after it. And then in subsequent rounds, you work increases on either side, just inside the markers: slip the first marker, work the increase, knit (or work in pattern, as required) until you reach the last marker/end of round, work the second increase; then, if required, slip the second marker and complete the round. In her basic patterns, Kate uses directional increases, the make-one left (M1L) and make-one right (M1R). They create nice, tidy lines at the edges of the gusset when you work the M1R at the start of the gusset and the M1L at the end of the gusset. Once you’ve got the stitches you need, and you’ve worked the right number of rounds, then you’ll put the gusset stitches on hold. You can use one of two things to hold the stitches: an actual stitch holder (or two very short ones), or a 6–8″ (15–20 cm) length of scrap yarn. When moving stitches to a holder, slip them purlwise so as not to twist them. After putting your gusset stitches on hold, you’ll cast on stitches to continue working the hand. After binding off the top of the hand, you’ll put the live gusset stitches back on the needle and knit the thumb. It’s clear that I’m really excited about Knit Mitts. With this great information on gussets, it’s easy to give it two thumbs up! 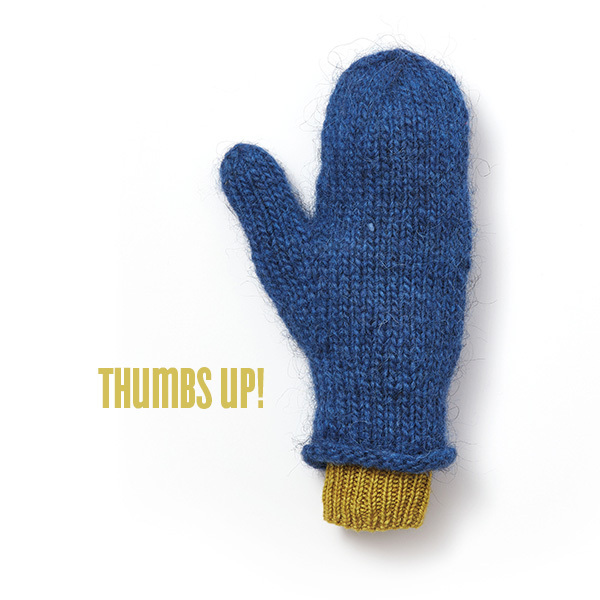 Learn to knit warm mittens & gloves that fit well—like a glove, even!